With time, patience and a really good microscope, you could count the atoms in your body. There are quadrillions and quadrillions. In the case of a 70 kg person, the number would be a 7 followed by 27 zeroes, the vast majority of them atoms of hydrogen, oxygen, carbon and nitrogen. 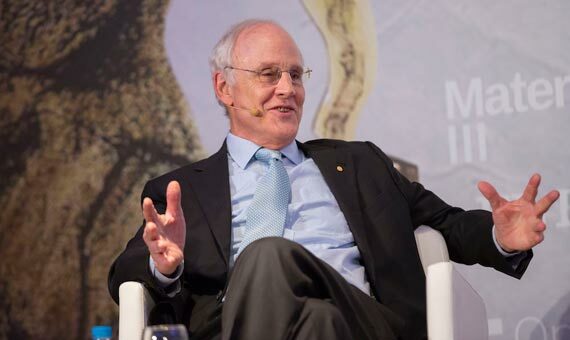 David Gross, born 74 years ago in Washington, D.C., discovered what keeps those atoms together and for that he won the 2004 Nobel Prize in Physics. The culprit, unmasked, is asymptotic freedom, a force of attraction that acts on the microscopic world of quarks —the indivisible bricks of matter— and is contrary to common sense. This force grows with distance, like the love of two people who miss each other when they are separated but can’t stand each other when they are together. Today, Gross continues doing research as a particle physicist and an expert on string theory at the University of California. Q: You often stress that there is confusion on the frontiers of physics and that we have a big problem. Why? A: On the frontiers of knowledge, there is always confusion. After all, when we talk about the frontiers of knowledge we mean the line between what we know and what we don’t know. What we know is always confusing. We have big questions, like how the universe began. With questions like that, one is very confused, understanding how the universe began. At the limits of knowledge we are always confused, almost by definition. At the moment, in fundamental physics we face many fascinating and difficult questions and, of course, we are confused if we don’t know the answers. We try to move forward with speculations, with ideas on what could be the answers, but they are often incorrect and, in the end, we’re more confused. The confusion can be very healthy because it stimulates us to think in new directions and come up with new ideas. Q: What is asymptotic freedom and why did its discovery deserve a Nobel? A: Asymptotic freedom is the name we came up with for a certain property of what turned out to be the theory of the nuclear force, the force that holds nuclei together, the force that holds the protons and the neutrons inside the nucleus, in fact, the force that explains the proton, the neutron and the nuclei that make up the centre of our atoms, in terms of particles we’ve never seen, called quarks. Now quarks had been thought about because it seemed like a nice way to classify these particles —protons, neutrons— but nobody had ever managed to produce a quark. No matter how hard we smashed protons together quarks never came out. If they were inside they should come out. The other thing, though, that was very mysterious were experiments that showed, in fact, that if you look with a very good microscope, particle accelerators, and over very short times, the quarks seem to move around freely inside the proton. If they moved around freely, why wouldn’t they get out? The whole thing was very confusing. A: What we discovered was that a certain type of force, which is a kind of a generalization of electricity and magnetism, could indeed explain both phenomenon. It said that with this kind of force the attraction, the force between the quarks, was very weak at short distances. That’s why we named it asymptotic freedom. At asymptotically short distances the quarks move freely. And yet, as you move the quarks farther and farther apart, the force gets stronger, so strong that you can never pull them out of the proton. That’s why you can never see a quark – you can’t pull it out. And that theory has turned out to be enormously successful in explaining the nuclear force. It’s given us the ability to understand where your mass comes from. Your mass is simply the energy of the quarks moving around inside the protons that make you up and being confined or held together by this force that grows with distance and decreases when you bring the quarks together. Q: What are the current limitations of the Big Bang theory? A: The Big Bang theory was invented by one of the people who thought it was a crazy theory, so crazy that he gave it the name the Big Bang theory. The theory essentially says that the universe, at some point in the universe’s history, there was a very dense hot small gas of all the elementary particles that exist and that that then expands according to the laws of general relativity. That part of the Big Bang theory has been empirically tested and verified and confirmed by experiment and observation. A: A newer and more recent part of that theory is that before that hot fireball began expanding, there was a period in which the universe had enormously accelerated expansion. It was expanding very rapidly. That’s called inflation, and that inflation occurred earlier. The universe expanded very rapidly and then all of that expansion energy was converted to radiation, to hot matter, the beginning of the Big Bang. That part of the story, the inflationary Big Bang theory, has also been in recent years well confirmed by observation of the cosmic microwave background radiation. This theory holds together beautifully and with a few parameters explains most of the history of the universe, except for what happened at the very beginning and what caused this rapid inflation and how did the universe begin. So today we are being forced to think back even farther in the history of the universe to the first moments and to try to even understand what it might mean to have a theory of the origin of the universe. That’s the biggest challenge, to understand this inflationary history and to understand the actual origin of the universe. Why did it start out the way it did? Q: And what do you think? A: I think it’s very confusing. Often physics reaches a point where it starts to ask questions that are brand new, in the sense that questions of a similar nature have never been asked. The origin of the universe is a question that used to be a religious or philosophical question, but now it has become a scientific question. We don’t know what kind of framework is needed to explain the origin of the universe. I’m not sure we’re ready to answer a question like that, that our conceptual framework is able to answer that question. In fact, most likely it’s not, otherwise we would have an answer. Many of the problems on which we are working, trying to understand the marriage between quantum mechanics and Einstein’s theory of gravity, are precisely related to this question, what the origin of the universe was. Q: Do you need God in your equations? A: To date, no. We’re not even sure what it means. There are some questions, of course, that people do ask and which physics does not address, even with the enormous progress that has been achieved over the last centuries. They are questions like “why is there something rather than nothing?” for which they often invoke the supernatural, God or faith. From my perspective, I’m not particularly interested in these questions, because they cannot be addressed with observations, measurements and mathematical theory. In other words, they are not scientific questions. These questions tend not to have an answer. I’m much more interested in questions that have an answer, those which science can address. Q: What do you think about string theory? Can it provide answers to the limitations of the Big Bang theory, for example? A: String theory is a new approach that began over forty years ago to try to understand the fundamental workings of nature, not in terms of point like particles and the forces between them, which is the way we understand, say, the nuclear force, which I was describing before as the theory of the nuclear force, the theory of how quarks, point like particles, interact. String theory says, or as string theory was constructed, it was supposed to be a theory of extended objects, a theory of strings, not points. This approach has taught us an enormous amount about how you might construct a unified theory of all the forces, including gravity. Q: Is string theory well defined yet? A: String theory is a journey that is not really a completed thing. We are in the middle of trying to understand what string theory is. In fact, we’ve discovered in recent years that string theory and our traditional particle theories are really all connected in a framework which is incredibly rich, and which appears to have the capability of two of the major goals of fundamental physics in current years: one is unifying all the forces of nature, the three forces that act within the atom and the nucleus and the force of gravity and, two, understanding how Einstein’s theory of dynamical space-time, of general relativity and gravity and quantum mechanics can live together peacefully. There is no question that to answer some of the fundamental questions we have, such as how did the universe begin or what was the source of the Big Bang theory, will require the marriage and this unified theory, but we don’t yet know the answer. What cannot be denied is that string theory has given us many ideas and has shown us the way to a unified theory of the forces of nature and the understanding of quantum gravity. Q: You say that physics needs a revolution. A: Physics always needs a revolution, because even if we understand something extremely well, we usually encounter new questions that require new ideas, new constructs and new developments. In my opinion, the questions facing us today, understanding the true quantum dynamics of space and time, understanding the principle of the universe, will be questions that will likely require new and revolutionary concepts. I may be wrong. Perhaps enough tools already exist to answer these questions but we haven’t yet figured out how to use them. But it could also happen that we simply don’t have the right concepts. Q: What do we know is wrong? A: Physics over the centuries has seen one cherished idea after another fall, and be replaced by something which at first is totally crazy and totally weird. We are celebrating today Einstein’s theory of gravity, which in a sense was a revolution in the way we think about space-time and overthrew Newton’s theory of gravity. Not to say that we still don’t use Newton’s theory of gravity all the time. If we send a rocket to the moon we use Newton. We don’t need Einstein for that. It’s a good approximation. And all of us know in our bones that the theories we are so proud of, which work so well, for which we got Nobel prizes, are going to be replaced in the future by some even better theory to which our current theories are extremely good approximations. Q: Why did you sign the Humanist Manifesto? A: The Humanist Manifesto, which I did sign, is a manifesto which argues that humanist values, caring for other people, working for social goods, etc. can be held without necessarily subscribing to a particular religious conviction or faith. Humanism is the name for the idea that one can have moral values without necessarily being a member of a church or believing in any particular religion. That one can be an atheist and still be a moral human being, and to some extent that is contrary to the argument of some religions that in order to be a good person, to be a moral person, that morality and good behavior are required by religion and, therefore, people that don’t believe in God cannot be good people or moral or engaged in moral behavior. So I believe very much in that Manifesto and that’s why I signed it. Q: What do you think about the possible existence of a multiverse with many parallel universes? A: Well, the multiverse concept is based on a few propositions, all of which are quite speculative. One is that the laws of nature are consistent with there being many different universes, which we can’t have any direct or causal connection with. If we did, we’d know about them, but we don’t and we can’t. So this is kind of uninteresting unless… In the modern multiverse concept the laws of physics would imply that different portions of the multiverse evolved into separate universes. In the modern inflationary Big Bang theory, one can and many do argue that that is what indeed happens. With inflation, different parts of a bigger universe can expand and become what we would now observe as our observable universe. In even more recent times this has become popular because of the fact that in the string theory approach to constructing unified theories, there appear to be many many solutions. So that is what physicists mean by the multiverse idea. It’s an old idea. People in the 19th century already talked about many universes, but without these somewhat stronger physical arguments. Are you convinced by the idea? I don’t like the idea for many reasons. One of them is that the scientific basis of it, both with respect to inflation and string theory, I think, is very weak and full of holes, and second, I suspect that… you see the multiverse, and one of its most unpleasant implications, is that many of the features of our observable universe, the one that we can actually observe, cannot be calculated. They are simply environmental accidents and that the values of some of the fundamental constants of nature are different in different parts of the multiverse, not that we can ever directly know about that. I find that a bit of a cop-out, giving up. Einstein once described the goal of physics as being able tocalculate anything from a set of fundamental principles. Physics has being enormously successful in doing so. I find it defeatist to give up at this point and say, “ok, well, there are an infinite number of universes and anything can happen.” I think we should continue, and I see no reason why we shouldn’t be able to understand the properties of this universe, the one universe we can actually observe and communicate with. "3,000 Laguages are Going to Die out During the Next Century"